Signs identifying some state lawmakers as former fetuses are generating controversy at the Capitol. Signs calling some state lawmakers former fetuses are causing a stir at the Capitol, with one representative accusing another of intimidating his staff by removing them. One of the signs appeared Wednesday morning on the wall outside Rep. Jonathan Stickland's office. It identifies the Bedford Republican as a "FORMER FETUS," using a format similar to the plaques near most members' doors. "It's just been ripped down and thrown in my staffer's face by Charlie Geren," Stickland said, referring to the Fort Worth Republican who chairs the House Administration Committee. Calling Stickland's account inaccurate, Geren said he simply removed the signs because they were in violation of rules from the State Preservation Board, which is responsible for making sure the Capitol grounds are maintained. "Tearing them down is hardly the deal," Geren said minutes after Stickland shared the story on Twitter. 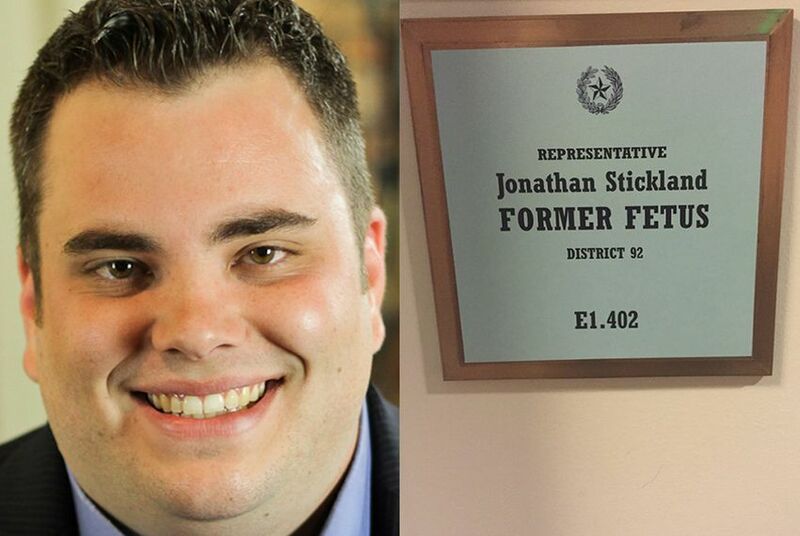 "If Stickland wants to act like a child, that's fair, but I did not rip it down." Stickland said the sign and others were distributed to some representatives by Texas Right to Life on Tuesday, a day before Planned Parenthood supporters were scheduled to come to the Capitol. "In honor of their visit, I put this sign up on my office door," Stickland said in a Facebook post with a photo of the sign attached. "Organizations that murder children are not welcome in my office." Right to Life tweeted Wednesday morning that it was "sad that signs are being torn down." Melissa Conway, a spokeswoman for the organization, said the group worked with a "few" legislators to produce the signs and let them decide how they wanted to put them to use. The anti-abortion group, she added, is "saddened by reports of intimidation to remove the signs." More than 100 Planned Parenthood supporters attended a rally at the Capitol on Wednesday afternoon. Many had come to lobby state lawmakers to continue funding the state’s breast and cervical cancer screening program for low-income women. The conservative Texas Senate is considering restructuring the program, which last year served about 34,000 women. “I believe we will get to a point where decisions that are made in this building, when it comes to issues of women’s health, will be decisions based upon health, and not based upon politics,” state Sen. Kirk Watson, D-Austin, said at the rally.